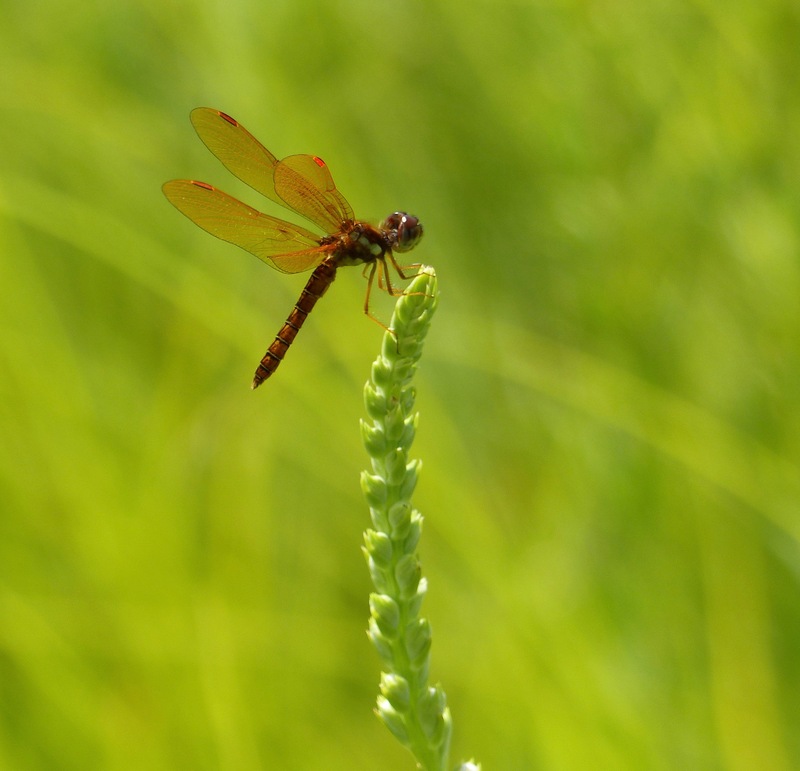 Image Credit: Cindy Crosby, "White-faced Meadowhawk"
Along the coastline of Lake Michigan, in downtown Chicago, they ride the breezes. At night, they shelter in trees and shrubs. Mornings by the Jackson Park lagoons you’ll see them deep in the grasses, cold and shimmering with dew. They shiver their wings, warming themselves by basking on rocks in the sunshine. Along the Chicago River, they pause on skyscrapers and concrete abutments, then lift off. Dragonflies (and their close kin, damselflies) are all around us. But few of us notice them. When we cultivate awareness of the natural world in the city, most of us turn our thoughts to the cuddly mammals, like a fawn poised at the edge of a city forest preserve, or even a squirrel scrambling across a power line. Birds also have a high profile. After all, who can resist the colorful monk parakeets in Hyde Park, or the spring migrations of colorful warblers—indigo buntings, scarlet tanagers, and Baltimore orioles—that brighten the branches of urban ginkgos and other city street trees? But bugs. Hmmm. Unless you are a pollinator (and dragonflies are not) you get mostly bad press. As a citizen scientist, one who collects data for research projects, I’ve monitored dragonflies and damselflies for the past decade or so in the suburban areas just west of Chicago. To “monitor” means I go to a certain area, walk a set route for about an hour, and, on my clipboard, count the number of species and different individuals. I walk my routes from April to October each year. This data is reported to the state of Illinois, which compiles it by region and notes changes over time. I should say here: Not everybody gets this. “So mom,” said my adult son recently, as we sat in his kitchen. “What good are dragonflies?” I had spent the morning taking two of his kids, age four and six, outside to catch dragonflies with child-sized nets I had given them for this very purpose. I love my adult son and his questions. He’s the child of two idealist nonprofit-loving parents. (My husband and I ran an independent bookstore for ten years; I worked for a while as a wilderness park ranger; my husband is currently a publisher at a small nonprofit.) We joke that our son took one look at our lifestyle and got as far away from it as possible. He now works as a financial consultant in New York City. Back to his question. I thought for a moment. In teaching prairie classes and giving talks on natural areas, I’ve discovered it’s important to find connecting points for people to the city creatures and landscapes that make sense to them. 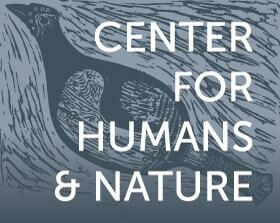 For some, it’s the history of the land or the economic value of a particular animal. For others, the aesthetic pleasure of a landscape or the engaging life cycle of a creature. A few are attracted to story—the story of animals or prairies or dragonflies. I talk more about this in my new book, The Tallgrass Prairie: An Introduction (Northwestern University Press, 2017). I knew that, through his work, my son has become much more of a pragmatist than I am. So I tackled his question from that angle. Dragonflies, I told him, are indicators of water quality. After dragonflies lay eggs in a pond or stream, the nymphs—or naiads, as they are sometimes called—spend years under the water. They look like particularly ugly beetles. Then, when the time is right, they clamber out of the stream and pump insect blood called hemolymph into their four wings. These expand and harden. With their now-strong wings, they lift off in flight. For a few minutes, days, or if they are lucky, a few months, they decorate the air around us. 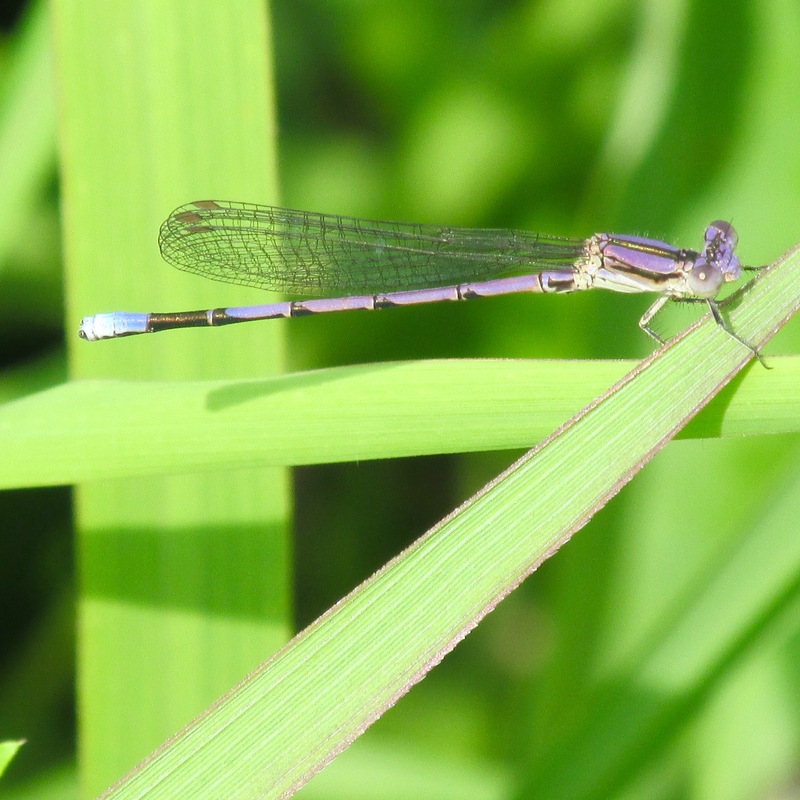 Population fluctuations in numbers and species of dragonflies and damselflies tell us if the water they emerged from is polluted, or if the weather patterns are changing. Clean water is the looming crisis humans will face in the next fifty years, I noted. When I monitor dragonflies, I am helping keep an eye on the water people need for life. He thought about this for minute. Okay, new tack. Dragonflies, I told him, are being studied by the aerospace industry. Because they have four wings that can move independently, they can tell us about better ways to build aircrafts and efficiently move people around. 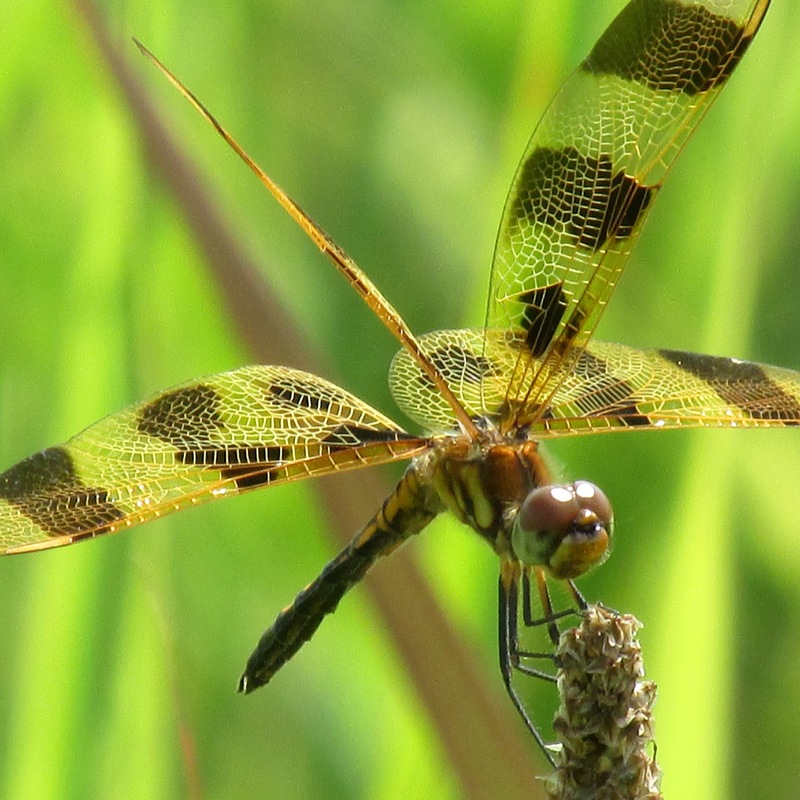 Dragonflies can navigate the air forward, backward, up, and down. Hover, zip and zoom. Yes, dragonflies are “pretty cool.” But none of these reasons quite capture why spending time with dragonflies in urban areas is so absorbing. Here is what I didn’t say to my son. To begin to know dragonflies is to get comfortable with mystery. In a world where we want to know, dragonflies remind us of how much we don’t know. 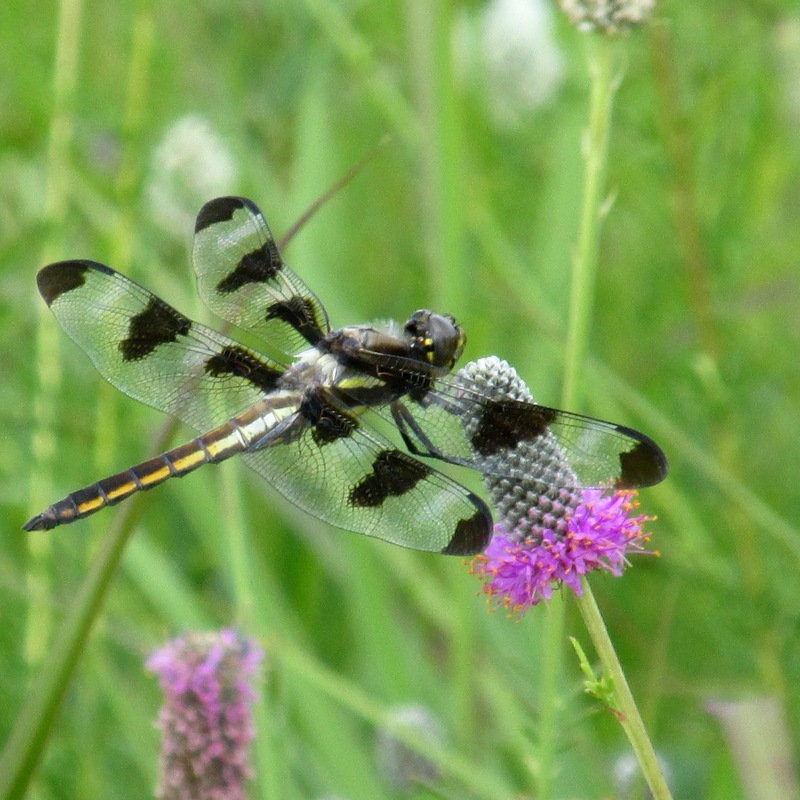 Consider this: We are learning that in Illinois at least four species of dragonflies—the wandering glider, the green darner, the black saddlebags, and the variegated meadowhawk migrate south. No single dragonfly makes the round trip. And yet, they know. But we don’t. In early spring, here come the dragonflies, a new generation, on their way back north. Why do some species migrate and others do not? How do they “remember” where they came from? What is the signal that it’s time to migrate? Why do they gather by the hundreds in the late summer and fly together to a new location? Scientists are still struggling to understand. In short: It’s a mystery. I like mysteries. Monitoring dragonflies is an extension of my longing for mystery coupled with a desire to know, and the tension that happens in that intersection between the two. 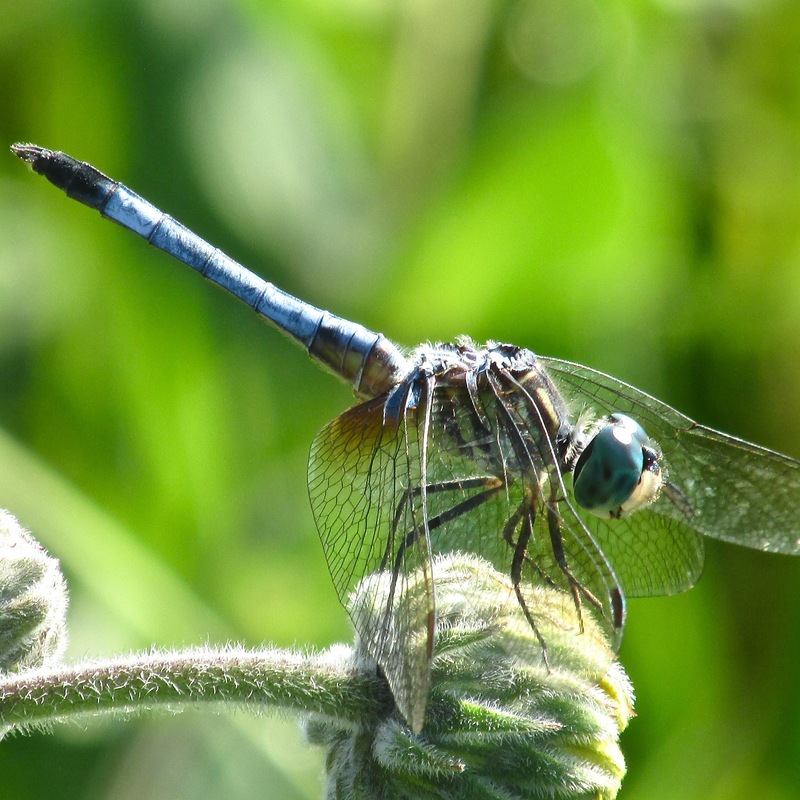 Cultivating an awareness of dragonflies also requires sustained efforts in paying attention. Amid the white noise of the city and suburbs, and the clamor of everything—from the gas pump at the BP station (which assumes I can’t fill my tank for three minutes without being entertained by a video) to the sidewalk outside the strip mall (which plays pop tunes on an outdoor speaker)—it is difficult to simply be. To be alone with my thoughts. To think. To fill up the “inner well” I have—and we require—to be fully human. I love the words of the mystic Simone Weil, who said, “Absolutely unmixed attention is prayer.”* As a person of faith, who never seems to find herself at ease in a particular congregation, this is the best way to pray I know. Thigh-deep in a stream in my waders, tramping through a prairie with my catch net, or sitting by a pond with a clipboard and data sheet—these are my natural sacraments. I sit for hours, sometimes, as the sun moves overhead. The dragonflies hovering above me throw shadows like crucifixes across my clipboard. My mosquito headgear is my chasuble. I swing my thurible—my catch net. My field guides are my sacred text. My prayers are the focus and energy I give to this time, this place. To the city creatures that share space with me for this moment in time. And in this focused concentration—these prayers—I find renewed gratitude for the natural world in all its diversity and wonder. *Simone Weil quote is from her essay, “Attention and Will.” From Gravity and Grace, translated by Emma Craufurd (Londong: Routledge and Kegan Paul, 1952). Originally published as La Pesanteur et la Grace (Paris: Plon, 1947). 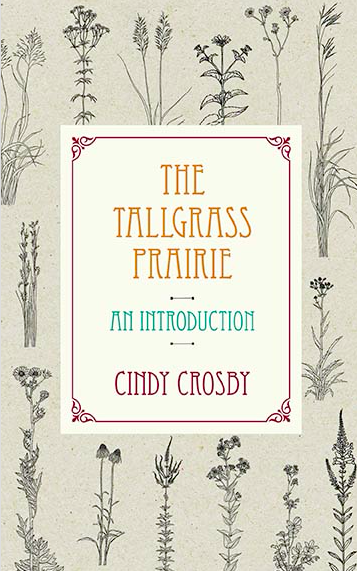 Cindy Crosby is the author of The Tallgrass Prairie: An Introduction (Northwestern University Press, April 2017) and the author, contributor to, or editor of 20 books. When she's not out chasing dragonflies, she speaks and teaches about prairie in the Chicago region.